Happy Mother's Day to all the moms out there! Today I'm celebrating my mom and all the lovely, leading ladies in my life! Don't forget to tell your mom you love her and treat her extra special today! 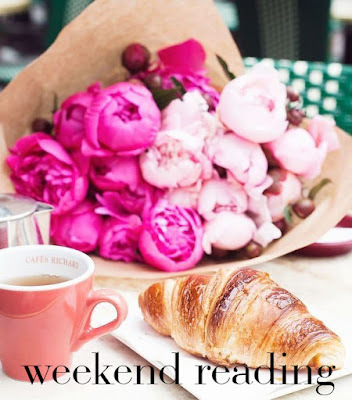 :) This week's Weekend Reading is awesome, as per usual and I hope you all enjoy! Like I needed another reason for Reese Witherspoon to be my ultimate girl crush. She just launched her Southern clothing and lifestyle brand, Draper James and it's perfect. Catchphrase with Sophia Vergara, James Marsden, Steve Higgins and Jimmy Fallon? Get ready to laugh! I'm now obsessed with hats. I've bought 3 already and after seeing all of these need more. Hey fellow KCers, here are a few things to do here in KC! Who doesn't love froyo? But who has the time or money to go to Peachwave or Pinkberry all the time? Not me. So here's an easy and healthy strawberry froyo recipe! I'll definitely be trying this out this summer! Acrylic and gold are all the rage in home decor right now and this DIY cute little table will add a chic touch to any room! While I'm not getting married for awhile here are several old fashioned wedding traditions I plan on breaking. Smashing cake into the face? Not a cute look. This is gold, absolute gold. Anna Wintour is everything. A graduation speech made up entirely of Beyonce lyrics. Greatest speech ever. Aren't a pro at home baker? No worries! Here are 11 tips to make your baked goods better! I'm a One Direction lover, #NoShame, and I absolutely love swing/big band music and this remix makes me wanna get up and dance! That is all I wrote for this week's Weekend Reading list! Lots of hilarious videos and great tips so be sure to check em out! What have you been loving on the Internet this week? Leave a comment with the link and I'll head on over! "my weekend is all booked"